As you near the 20th Street and 5th Avenue intersection, the tall sculpted towers of Immanuel Lutheran Church immediately capture your eyes. Just to the west of the church is its 1912 parsonage, and, next to that, is the site of the historic Lutheran School and Hall. We thank an Argus/Dispatch reader who submitted the vintage postcard of that school that is featured. Immanuel Lutheran Church – also called the German Lutheran Church – has been involved in education throughout its history. The congregation has maintained a school since 1856. After the church moved to its 20th Street and 5th Avenue location (there was an earlier church before the current church was built in 1896), it built a new school at a cost of $4300 in 1885. That school, at 428 20th Street, was a 2-½ story brick building with an exposed stone basement and a front facing gable roof. It served as a school until the postcard school was built. Even after it was no longer used for classrooms, the church used the former school as a residence for custodians and staff. Finally, in 1969, it was demolished for parking space. 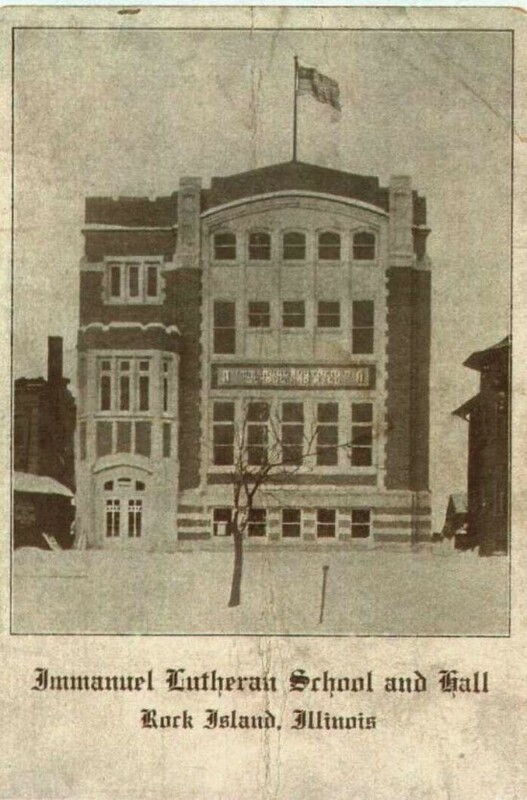 By 1900, the 20th Street school was overcrowded with 115 students, so the congregation decided to add two new schools – one on the west side of Rock Island and one on the east side, to accommodate Moline Lutherans. The west side school was located on the corner of 10th Street and 8th Avenue in a former grocery store and the east school was in a house known as the Raisch property on 38th Street. A 1966 Argus article shows the former east school at 1409 38th Street just before it was demolished. The small 1½ story frame house was identified as being used by Immanuel Lutheran until a new school on 36th Street (between 12th and 14th Avenues) was built. The article also noted that in 1900 there were only three houses “on the hill” so that the soon-to-be demolished building must be at least 100 years old. The west end school may have also changed sites, to a spot on 8th Street between 8th and 9th Avenues. But all these old schools were soon to be history. On August 11, 1918, the cornerstone was laid for a brand new school to accommodate all students. That school, depicted on the postcard, was designed by local architects Olof Cervin and Benj. Horn in what could be termed an “Educational Gothic” style. The construction proceeded rapidly through the fall and winter, in time for dedication ceremonies on Sunday, January 26, 1919. The dedication was a daylong affair with two separate events. A morning celebration was held in German (remember, this was the German Lutheran Church), while the afternoon’s events and presentation were in English. The church choir and pupils provided hymns and songs while local and visiting pastors gave sermons and speeches. After the morning presentation, the congregation marched from the church to the new school, where contractor H. W. Horst formally presented the school keys to pastor Rev. Wilhelm. After Rev. Wilhelm unlocked the doors, the new building was open for inspection. It was designed to accommodate every imaginable church and school need. A double bowling alley in the lower level basement provided a home for the congregation’s bowling league. The double height third story held an auditorium-gymnasium with a balcony as well as a kitchen. There was a stage located on the north wall. This well-planned school served the congregation for nearly 40 years. By 1953, the school had once again outgrown its space as it reached its capacity of 150 students. After years of fundraising and construction, a new and larger building at 3300 24th Street was occupied in October of 1957. Then, just as the church was obtaining bids to convert the old school to a Sunday school, a devastating fire struck. On March 17, 1958, a 9 pm alarm summoned firefighters. They responded by extinguishing the blaze with an estimated 150,000 gallons of water. The source of the fire was unknown, but it was speculated that lint had somehow been accidentally ignited. Church bowlers and their pinsetter, who had been practicing in the basement lanes, were startled at the beginning of the fire when smoke began seeping into the basement. In the aftermath of the fire, it was found that the third floor of the building where the fire started was totally destroyed. Water damage to the rest of the building rendered the condition such that the possibility of total demolition was strongly considered. Damage to the structure was reported at $75,000, and its lost contents were valued at another $3000. Even the parsonage next door suffered damage because it was sited so close to the school. The pastor and his family had been evacuated during the fire. Although the school building was partially rebuilt for Sunday school and meeting rooms, it had lost its third story. Fortunately all of the architectural details that could be salvaged after the fire– the “towered” front entrance, the stonework sign, the patterned brick – were saved during its rebuilding. Unfortunately, the loss of the third story was significant. Nearly half of the school’s total height was lost, greatly changing its proportions and compromising its appearance. About twenty years ago, the school was rented to Project NOW, although it was still used for Sunday school. After Project NOW left, the congregation was left with a vacant and unneeded building. A reluctant decision was made to demolish the old school and replace it with green space. The green space may be a place for former students to remember the happy times – as well as the saddest time of all, the 1957 fire that irreparably destroyed the beauty of this school. This article by Diane Oestreich is slightly modified from the original, which appeared in the Rock Island Argus and Moline Dispatch on November 4, 2001.